Apart from the dedicated who kept the faith (And undoubtedly live in and around the band's home town of Perth), most would have assume that heavy rock act Karnivool were a spent force due with the lack of any activity in recent years. In the seven years since Karnivool first came into being, the Western Australian hard hitting act have gained a legion of devoted followers with little more than a few studio recordings (2000's self titled E.P., 2001's Persona E.P. and 2002's single L1FELL1KE) and some fairly high profile support slots to a host of visiting international acts (As well as playing their own shows in and around the local scene). But for the last four years (Especially those living on the east coast), it's been 'All quiet on the western front', so to speak. Unbeknownst to most though, Karnivool have been anything but quiet. In fact, it would seem that it's taken the better part of three years for the act to consolidate their new line up (Currently consisting of vocalist Ian Kenny, guitarists Andrew Goddard and Mark Hosking, bassist Jon Stockman and recent addition Steve Judd on drums, who does double duty in fellow Perth act Hope Here Gone) and to write and record material for their debut full length album Themata. So with so much time and energy spent in the making Themata, one has to wonder if the difficultly the band experienced getting the album together was worth the three year wait? Well the answer is thankfully a definite yes! Perhaps the line up change has played its part, but Karnivool have finally delivered an album that will take them up to the next level. Themata is clear evidence that the band's song writing skills have elevated into a whole new spectrum of sophistication, with maturity and a growing confidence evident throughout the albums eleven tracks. From the moment the mid paced Cote ventures from the speakers, you can tell that an emphasis has been made on both sound and atmospherics. Huge multi layered melodies and harmonies are carefully woven around the recorded instrumentation (It has to be said that the production is simply huge! ), bringing together a song that is not only majestic and epic sounding, but still provides plenty of heavy rock. If there's to be a comparison of any kind within the title track Themata, it has to be A Perfect Circle. 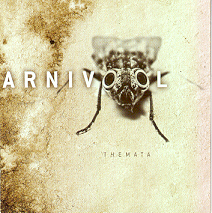 But rather than emulate the same formula, Karnivool manage to borrow and twist into original ideas, rather than simply plagiarize outright (Especially within Kenny's vocal lines, which hint at a slight Eastern influence in places). The current single Shutterspeed and Fear Of The Sky are concentrated driven numbers with some great lead work amongst the gritty guitar riffs, while the heavy swagger of Roquefort is underpinned by a seriously heavy funk influence that works amazingly well (Regardless of how bad the description sounds!). Karnivool's previous single L1FEL1KE is by far the albums weakest track (It reveals too much of the bands early nu-metal influences), and when stacked up against the blistering fast paced progressive instrumental Scarabs, the difference is painfully obvious. Acoustic guitars and strings are used to their full advantage on the stirring Sewn And Silent, while the heaviness is slowly built up once again in the slower paced Mauseum and Synops. The meaning behind Omitted For Clarity (Or joke for that matter as it's actually twenty seconds of silence) isn't clear at all, while the atmospheric/sample laden Change (Part 1) ends in what is undoubtedly going to the leading track on the next album (Suffice to say that it's very Roger Waters like effect wise). 'Themata' is quite simply a stunning release, and could easily compete on an international level if the band weren't still unsigned, and managing themselves. I'm not about to claim this will be the best Australian release of 2005 just yet, but what I can say right now is that anything that tops Themata is sure to be one hell of an album!